You WILL get a tracking number via email for your order within 24-36 hours of placing your order. That tracking number will update when it hits the first USPS distribution center within 24-36 hours of you getting your tracking number. This is because of how the Postal Service updates tracking and we can not speed up that process. Want to track your package? You can track your package and get your tracking number by looking in the email you get from us letting you know your order has shipped. That email may take 24-48 hours to go out after you have placed your order. 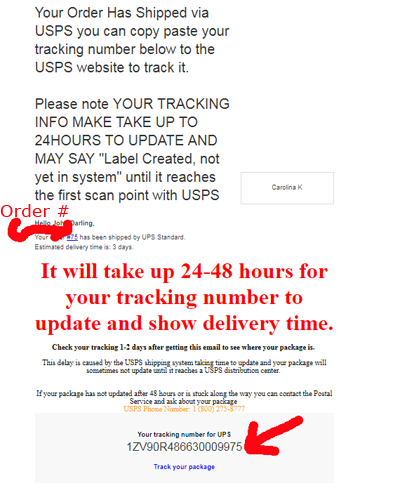 Once you recieve it you can see your tracking number (image below). Your tracking number may not update for 24-48 hours or until it hits a USPS distributuion center. We have descreet packaging. Your order will come in a plain box or padded envelope with "Carolina K" as the return address. This shipping service will generally get your package to you in 1-3 days depending when you order. This shipping service will generally get you your package in 1-2 days depending on when you order. One day shipping does not mean you will receive your package the same day, orders placed late in the day or on weekends can also delay shipping. No express shipping after 1:00pm eastern Monday thru Friday. Once you place your order and get an email your order will ship right away. Your order will say AWAITING PAYMENT until we get your payment back from the post office. Your order will ship as soon as we receive it. It will arrive at your local post office and your mail carrier will attempt to deliver it to your home and collect payment, if you are not home or can not pay you will get a slip in your mailbox that you can then take to the post office and pay for your order along with the COD fee. If you choose COD you will get a free gift with your order. Simply pay your mail carrier or go to your post office with the COD slip you got in the mail and pay for your order. You can use cash to pay for your shipment at the post office. You can NOT use other forms of payment like a credit card at the post office. 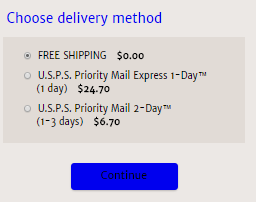 Once you pay for your order at the post office they will give you your package. Please not that there is an additional charge of $11.20 for COD that is charged by the post office but it allows you to order now and pay when you pick it up at the post office. The extra $11.20 charge will NOT show up in your cart or order history as it is charged by the postal service when we ship your package. Make sure to take $11.20 more than your order total to the post office to make sure you can receive your package.